Thanks for your well thought out post on the topic of allowances. We have long struggled with this. 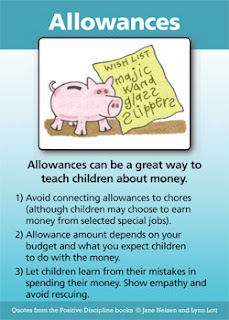 We doled out allowance based on age and our income at the time, and didn't tie them to chores. But now we have a problem. Income has changed (lower) and I feel we can't go backwards on the amount. We have tried to make them use it for extra treats at the movie theater, or a donut from the gas station, but it is hard, sometimes, when it's Mom's idea and they don't have their allowance along. And, two of our kids have bank accounts to save up money, but usually ask us to transfer something from their account so they can use what is our money to pay for something. We had said that they couldn't buy anything unless they had $ in hand, but it's hard when we're at Shopko, they see something, unofficially "have" the money, but not the cash with them. Also, our oldest (13) only gets $3 a month, because he agreed when we got guinea pigs that he would pay for all their supplies. So, he really can't buy anything, and it's hard (although I guess ok) when the others are getting donuts at the gas station and he can't, so I usually give in and buy him one, but that's not fair to the others. My main concern is chores. If I'm not doling allowance based on chores done, how do I get them to do the chores? I am going to start paying them for "extra chores" beyond their daily responsibilities. I appreciate your support.